In the mean time we have some guest designers joining us from Polkadoodles for a few weeks. Today we have the lovely Naz Smith and Anita Byrne joining us. This will save you a massive 25% off in the download store all week until Monday 6th July so don't miss out on all those yummy bargains! 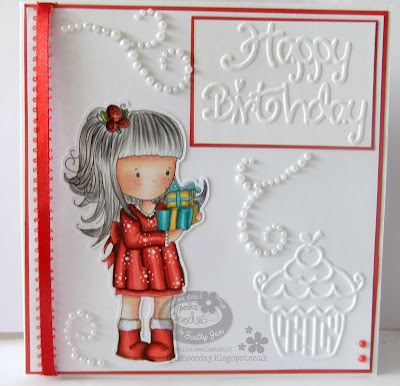 It can be heat embossing with embossing powders, or dry embossing using an embossing folder or even the old metal stencils and a light box. and the winners will be announced on 21st July 2015. The winner and top 3 for week 23 can be found at the bottom of this post. 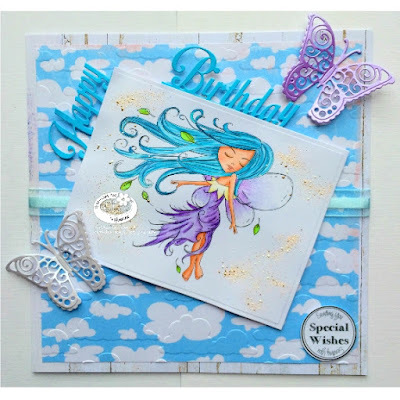 Naz - The image I have used here is called SERENITY STARDUST and it is part of SERENITY FAIRY WISHES collection. 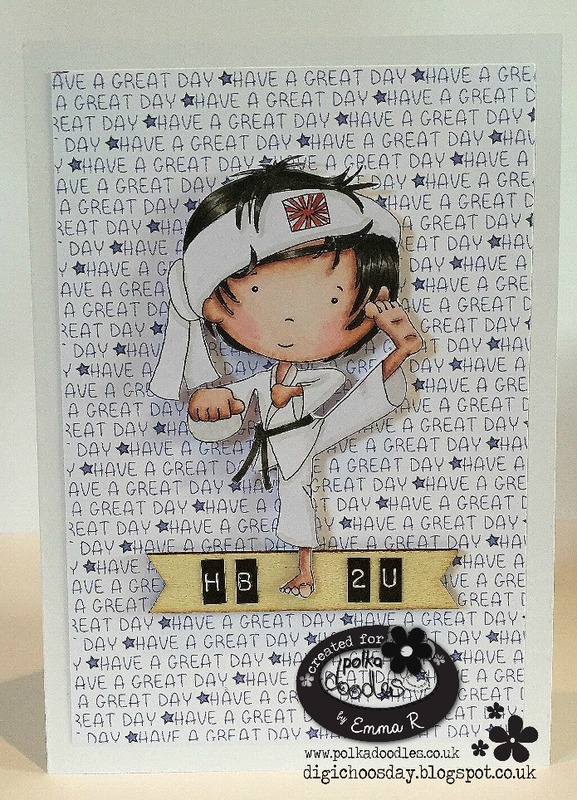 This collection is one of my favourite collections from Polkadoodles and it comes with beautiful black and white as well as coloured digital stamps. Also the collection includes papers and sentiments. Anita - Hi there such a privilege to be here, Today I have used Pretty Tuff CD collection , the papers are super lush and little jake is just awesome and available on his own Here. The embossing folder is from Darice. 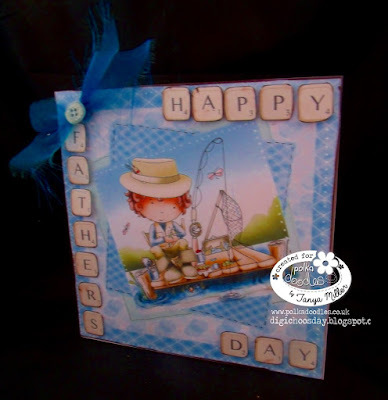 Wendy - I've used both dry and heat embossing on this project. I have dry embossed the backing paper, which can be found as part of the Nikky mini kit. The bonnet image is one of the embellishment digi's from the Rose Budd collection. My heat embossing is the semtiment in the corner. Caz Hi all...For my use some embossing make i have used the cute Serenity Fairy Kisses coloured with my graph it markers. The embossing folder i have had for ages, but thought it suited the image..Background paper is from Eden Collection-Paper Heaven 4. Some die cut butterflies, and bow added. And strip of lace..
Emma - For my embossing card i have used the super cute Winston Bear Gone fishing who can be found Here, I have distressed the embossed paper with distressed ink to bring it out. All the papers & embellishment are from the complete Winston collection that can be found Here. 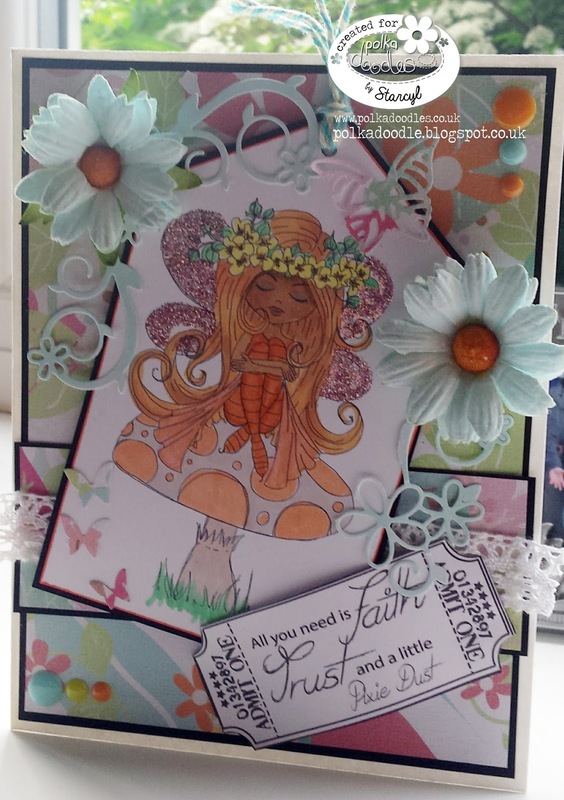 Yvonne - I have an addiction with Polkadoodles Serenity Collection and this week I used 'Earthstar'. I coloured her with my polychromo pencils. I have used papers from the Serenity Collection and also used one of the papers from the Distressed Wood papers. I embossed the cloud paper with a clud embossing folder. 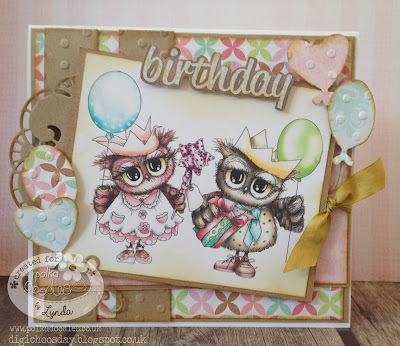 I added a wee bit of shabby pink frantage to the image and heat embossed it. Monica - For my project I`m using one of the new digis from Fairy Tales Happen, the beautiful Snow White and to cutting files from Polkadoodles store that were perfect to work with embossing folders: apple card template and decorative nest, From both files I got a beautiful and clean cut no matter how fancy it was. Anjie - I have used a pre coloured image, embellies, word art and a sentiment all from the fabulous Work and Play 10 download collection. You can buy this as a CD should you wish, and also in smaller download collections. And should you wish to buy the image on it's own you can. 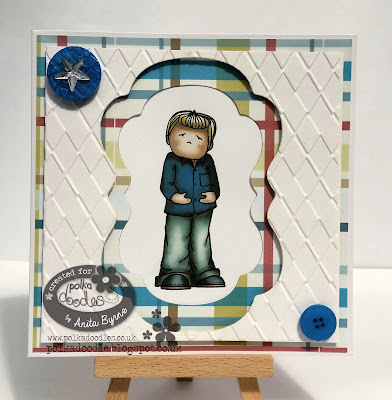 The embossing folder is from Tattered Lace. More photos and details on my blog. 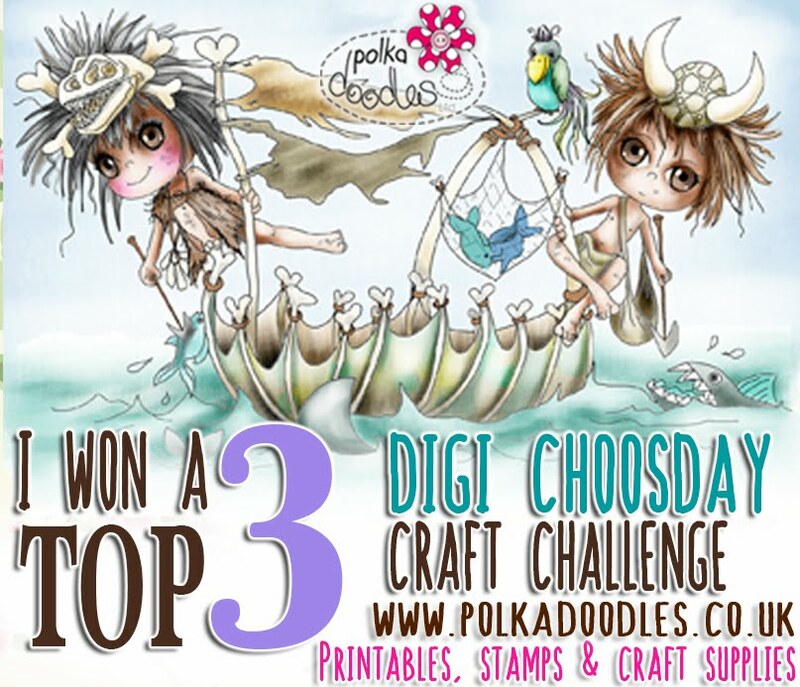 Please email us at sales@polkadoodles.co.uk quoting DCW023001 to claim your prize of a $15 of free downloads from the digi store! 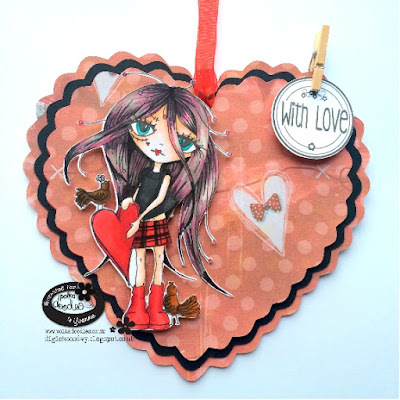 wk 25 Crafting Challenge at Digi Choosday - Tag it! Before we get onto this weeks challenge we have some new releases to share with you. 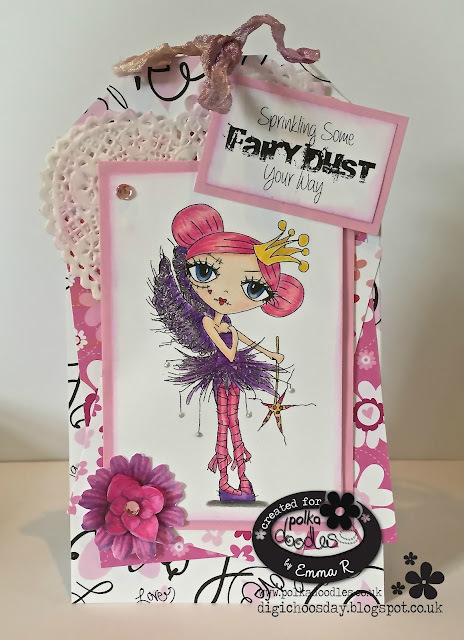 The fabulous Nikky has only gone and drawn us some Fairytale characters! To say they are lush is an understatement, just look at them! Before we get onto this weeks challenge we need to let you know we are looking for some Guest Designers to join us for a few weeks. To apply all we ask you to do is enter this weeks challenge and add GDT to your name in your link up. We are looking for people of varying skills so please don’t think you are not good enough. Come on, give it a go, what have you got to lose? 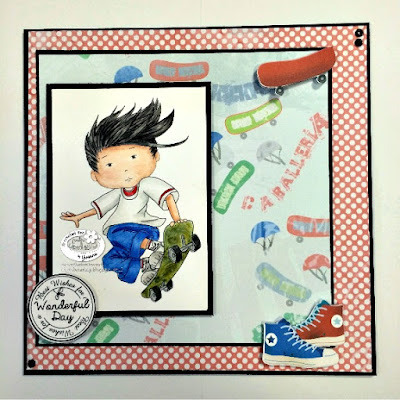 It is a fabulous, friendly and supportive team to be a part of so if you love Nikky’s work and can make one card a week for two to four weeks then let us know! In the mean time we have some guest designers joining us from Polkadoodles for a few weeks. Today we have the lovely Louise Sims and Jenny Lowton joining us. We are also celebrating this week the fact that Wendy and Julie have been on the team with us a whole year! How they have put up with us is beyond me, maybe they are as mad as the rest of us? Now onto this week's business. off all downloads in the store until 25th June so make sure you don't miss this code, it's only valid for 48hours! 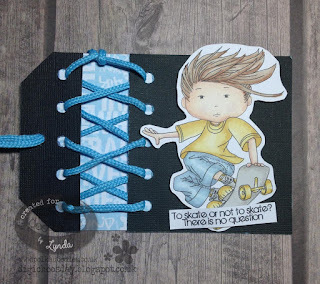 You can make a tag, you can make a tag shaped card, you can make a card that has a tag on it, anything at all as long as it features a tag somewhere on it. and the winners will be announced on 14th July 2015. The winner and top 3 for week 22 can be found at the bottom of this post. Lou: I have made a tag card from a DL card by just removing the corners. 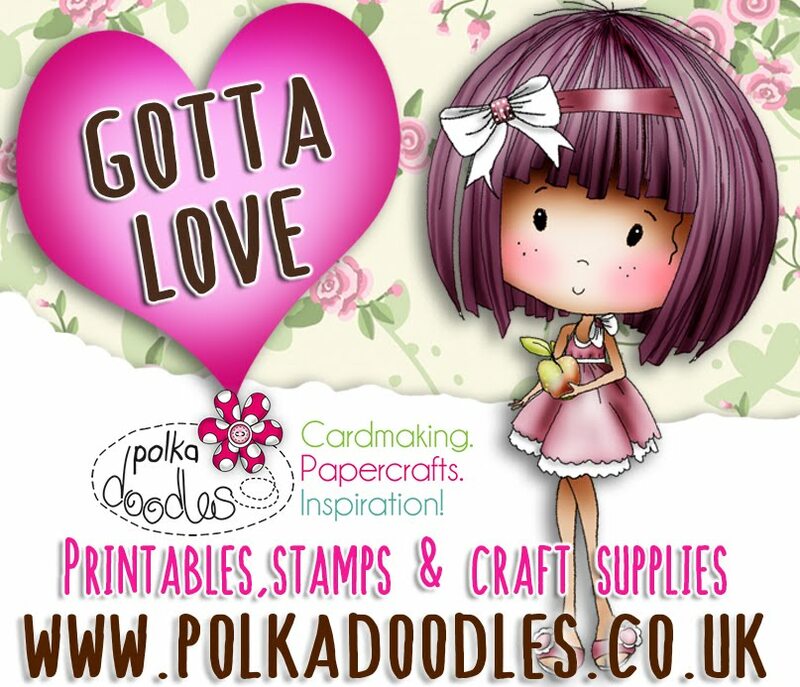 I think one of my favourite Polka Doodles paper collections comes from Dollie Goes East collection; so varied and versatile. 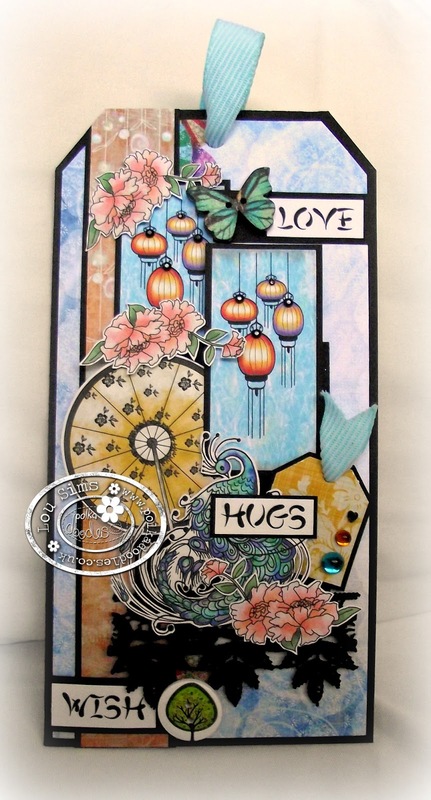 I have used lots of the elements and sentiments to create my card. I did also sneak in a little tag too. 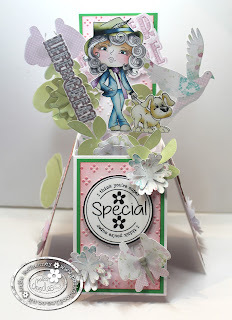 Jenny - Hi it's good to be joining you this week and I love tags but rarely use them so this challenge was perfect for me. I have used one of the lovely digi's from the Serenity collection and she is Serenity Resting you can find her here. I have used some pencils and Graph'it pens and I think she really looks like she has been tangoed! 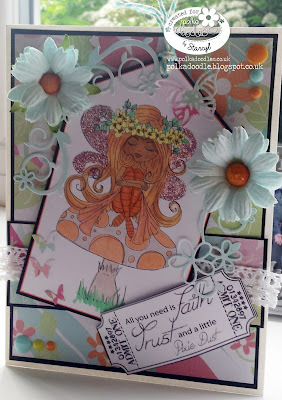 Anjie - I have made the tag out of some Kraft card and then the papers, embellies and sentiments are all from the fabulous Picknix 2 Gingerbread Twist collection. I have used the Tea Dye distress ink to darken the edges of everything and added some faux stitching onto the papers. The 2 Picknix collections are available as smaller downloads and some even as physical paper stacks, which are so strokeable! You can find them all HERE. More details on my blog. 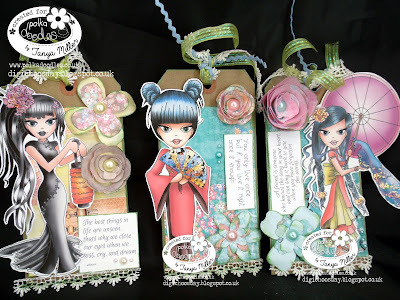 Tanya - I love making tags because they can be elaborately or simply decorated and it gives you a chance to use lots of the little embellishments you may have lying around in your craft room. I’ve decided to use the Dollie Goes East collection and have used three of the coloured digis which I’ve resized in a graphics package and printed out and then used some of the lovely papers available on the collection with the flowers which I’ve resized as well to go onto some Kraft Card tags and finished them off with glitter, gems and ribbon and lace. I’ve made these three tags so that they can be used as cards so I printed off three different envelopes (also on the collection) and they will be just great for the tags and are just the right size too. 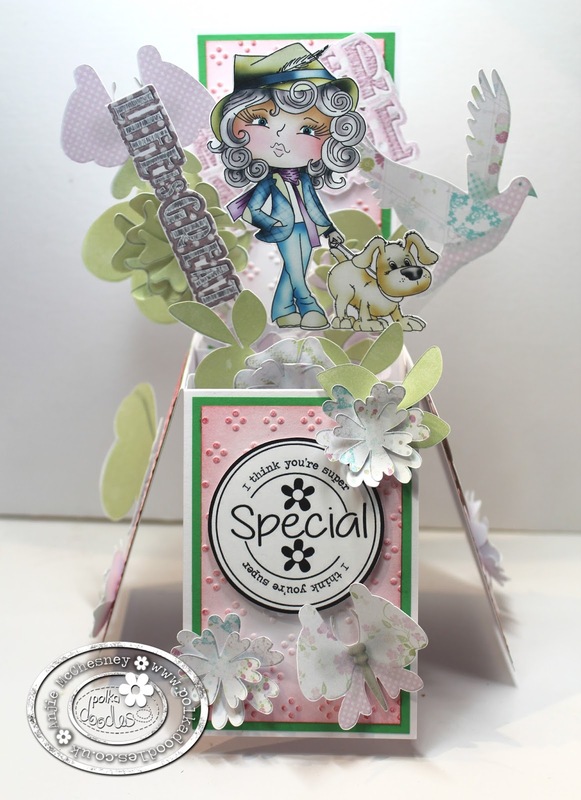 Monica.-For this week challenge, I chose a beautiful shaped tag and cut it different sizes to make a tag mini album. 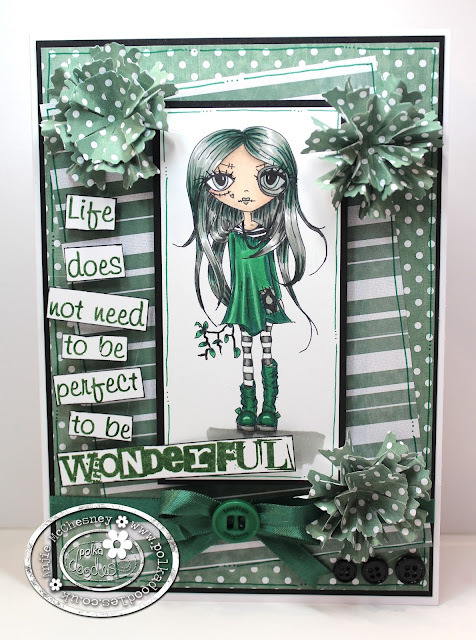 For my mini album I used the beautiful papers, embellisments, flowers and sentiment from Octavia Moonfly Collection. 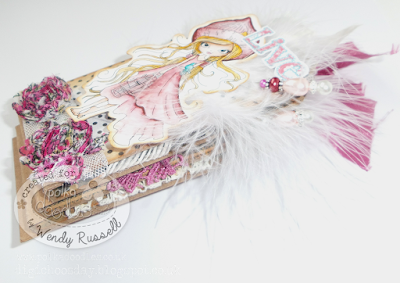 Caz Hi everyone, for my Tag i have used the lovely Oddella Bow. 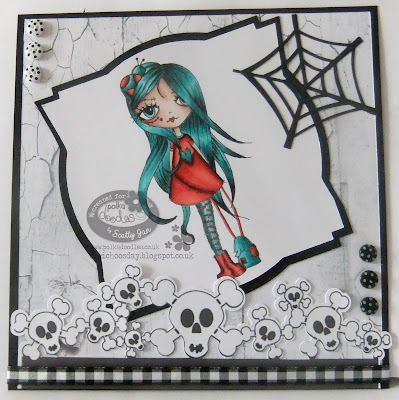 Gone a bit different and coloured grey tones, using my Graph it markers..Paper is from Distressed Wood Paper download. I've added couple of skull flourishes cut on portrait. Yvonne - I HAD to use Oddella again because it has been tooooo long since I played with her! So I opted for Oddella Heart. Soooo sweet! You can see her here. I used a scalloped heart nesting cutting file that I cut out three hearts of. 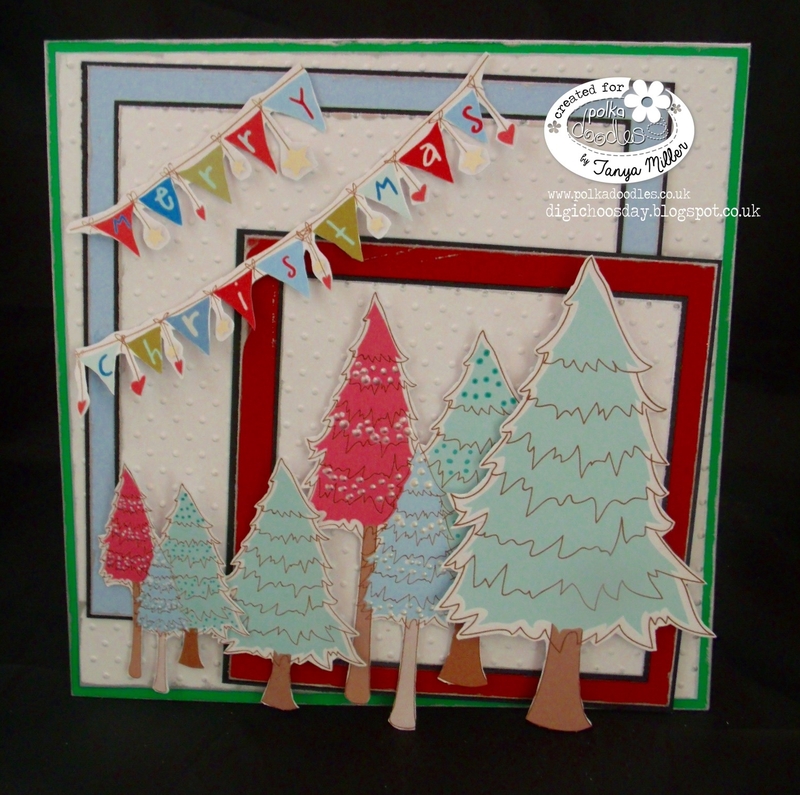 I used a backing paper from the Picknix Gingerbread Twist Collection, which you can see here. Not just for Christmas! Wendy - Well seeing as it's my 1st anniversary this week for being on this fabby team, I gone all out and used not 1 but 4 images. (Greedy, I know!) 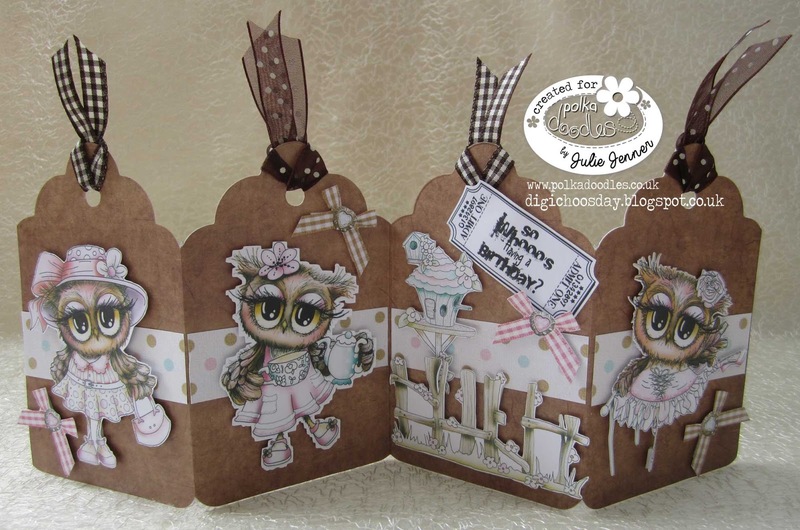 I've used Octavia Bird in Hand on the front and the 3 other images on the tags inside are all from Octavia Moonfly. 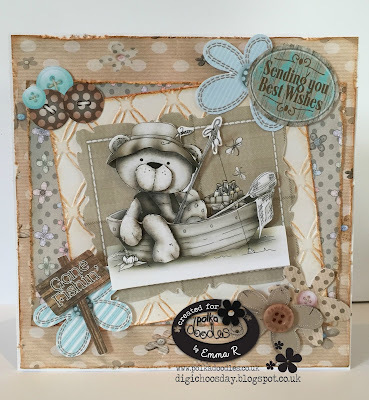 The papers and sentiments are all from this collection, however they can also be found in mini kits on the Octavia Collections page. 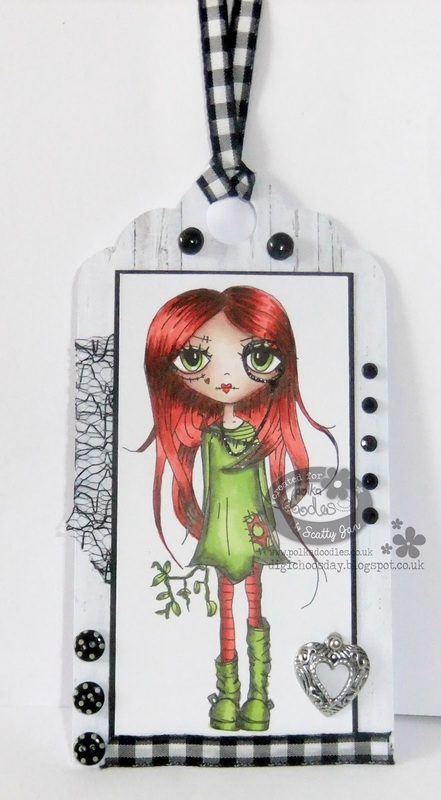 Emma - For my 'Tag it' card I have made a card that is a tag shape, i have used Oddella Fairy who can be found Here & have coloured up using my pencils. All of the papers are from the Work & Play 9 - Love & Kisses collection that can be found Here, the sentiment & flower are from another of the fab collections called Octavia Moonfly which can be found Here. I just added some gingham ribbon through 2 tag holes and brown dotty organza ribbon through the other 2 holes. 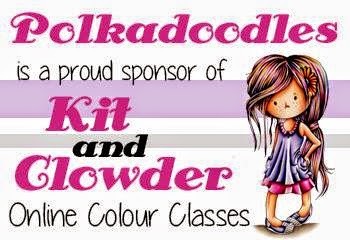 Please email us at sales@polkadoodles.co.uk quoting DCW022001 to claim your prize of a £5 of free downloads from the digi store! 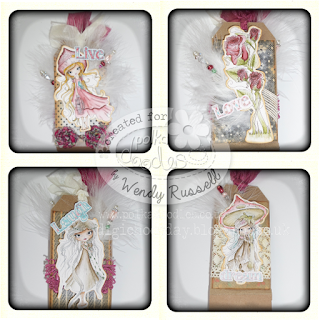 You can grab them HERE along with some new ribbons which will go great with these images! 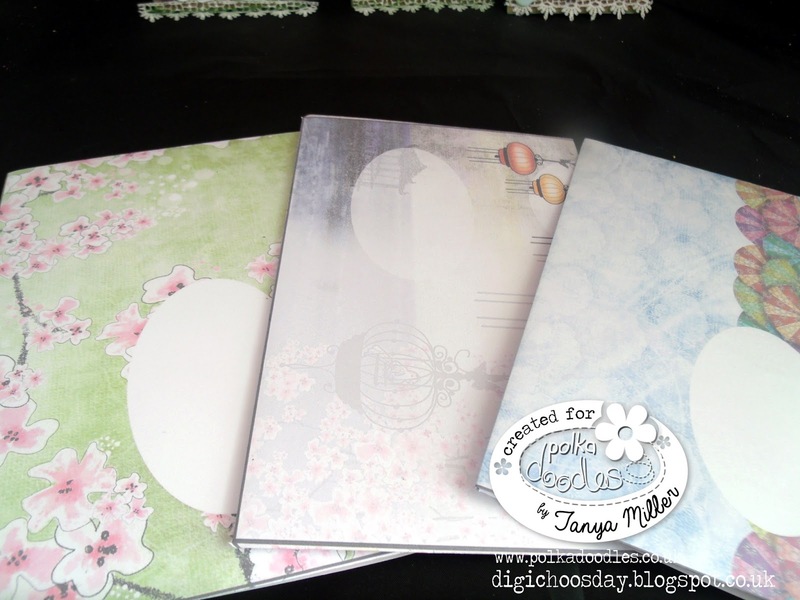 And of course because it’s Digi Choosday it is also discount day!!!! and this will save you 10% on all downloads until next Monday! don't miss it! You can use real buttons or faux buttons, and there are plenty of those on Polkadoodles CD’s! and the winners will be announced on 7th July 2015. The random winner (chosen by Random.org) will receive $15 worth of downloads of your choice from the digi store! The winner and top 3 for week 21 can be found at the bottom of this post. 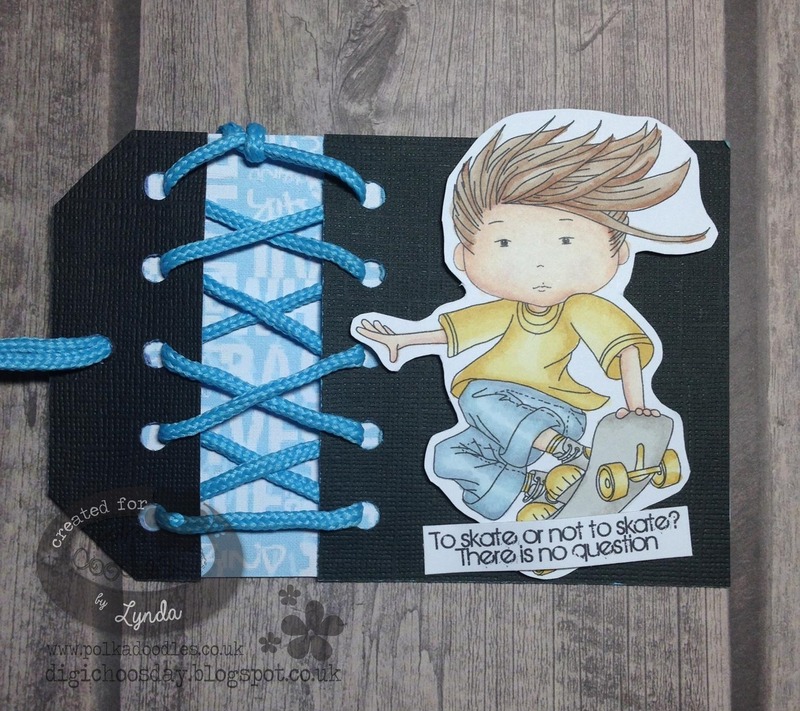 Tanya....I’ve decided to use the latest Work & Play 11 Collection using a black and white digi I’ve coloured with Graph It pens, papers and sentiments and the wonderful gymnastic beam. You see, my sister is an absolutely wonderful gymnast and runs her own gymnastic business and so with her in mind I’ve decorated the card with some of the alphabets on the Eden collection together with the flowers which I’ve resized in my graphics package by Do Crafts. I’ve put the buttons in the centres of the flowers and with a smattering of glitter on the ribbon…. Voila!!! Emma - For my 'Use some buttons' card I have used the super cute Twiggy & Toots collection that can be found in digi format Here or CD format Here. I have layered one of the journalling frames over the fab Reading, Wise words & Tea coloured digi that can be found Here & it has come out looking like he's been framed. 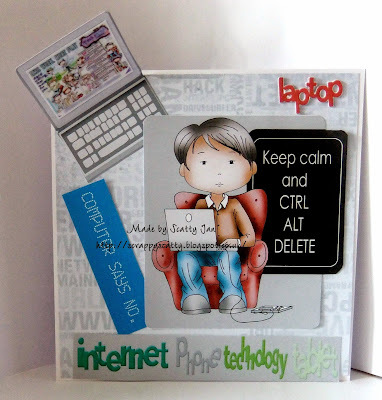 I have also used some of the papers that are in the collection & of course added a few buttons. Caz For my use some buttons card i have used the cute Umbrella-rainy-day-friends-boots-wellies from the fab Twiggy n Toots collection..Papers and sentiment also from same collection..Available on CD or if you prefer Download. Coloured with Graph it Markers. 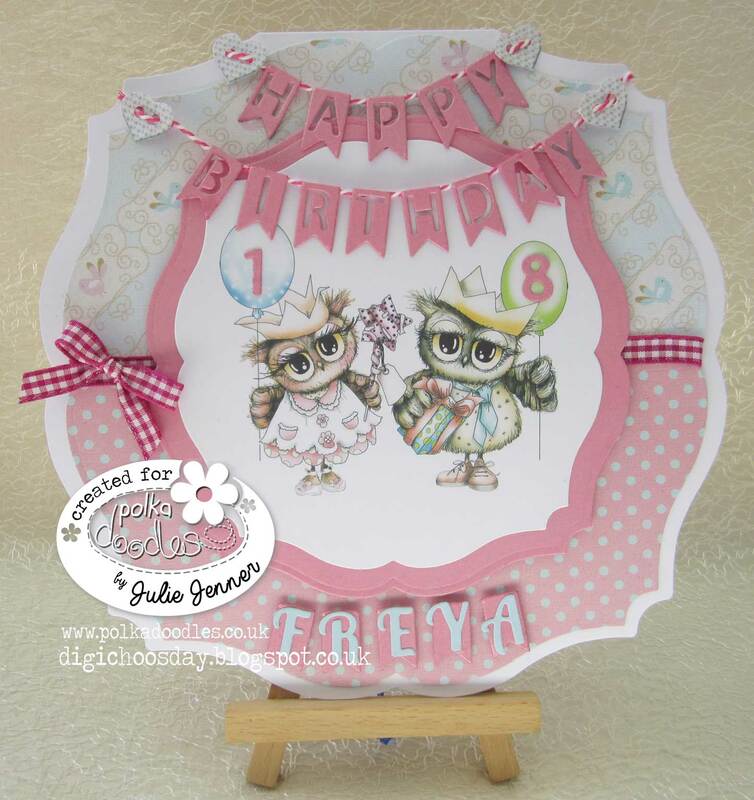 Julie - I needed to make an 18th birthday card for my daughter Freya and her best friend Olivia. I have been dying to use the new Twiggy and Toots Digi Download and I thought this image was perfect to add a 1 and 8 to in the balloons. The coloured image, cute little digi heart buttons and both gorgeous papers are from the Twiggy and Toots full digi download, it's great that you can download the collection straight away and can get crafting immediately but if you are patient and would prefer the collection on CD it'savailable at Polkadoodles Store. The image is called Party Birthday Celebration and is available singly HERE. 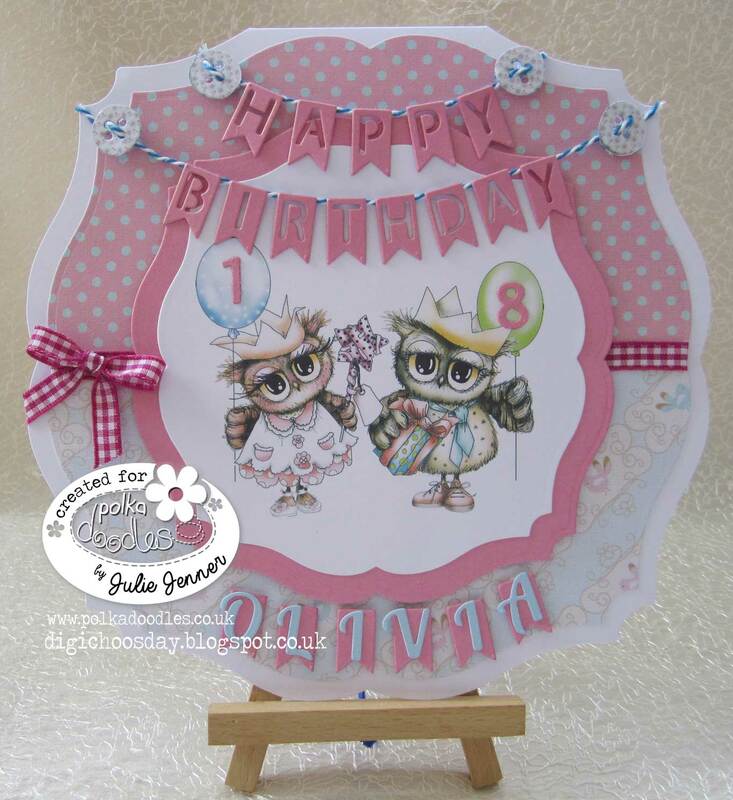 Both cards are similar as I wanted to use up the other half of the papers but have added blue bakers twine and circle buttons to Olivias card, the papers have been added the opposite way on the 2nd card. Monica ,- I love quilting eventhough I don`t know how to sew. So this week challenge gave the perfect excuse to do some paper quilting. 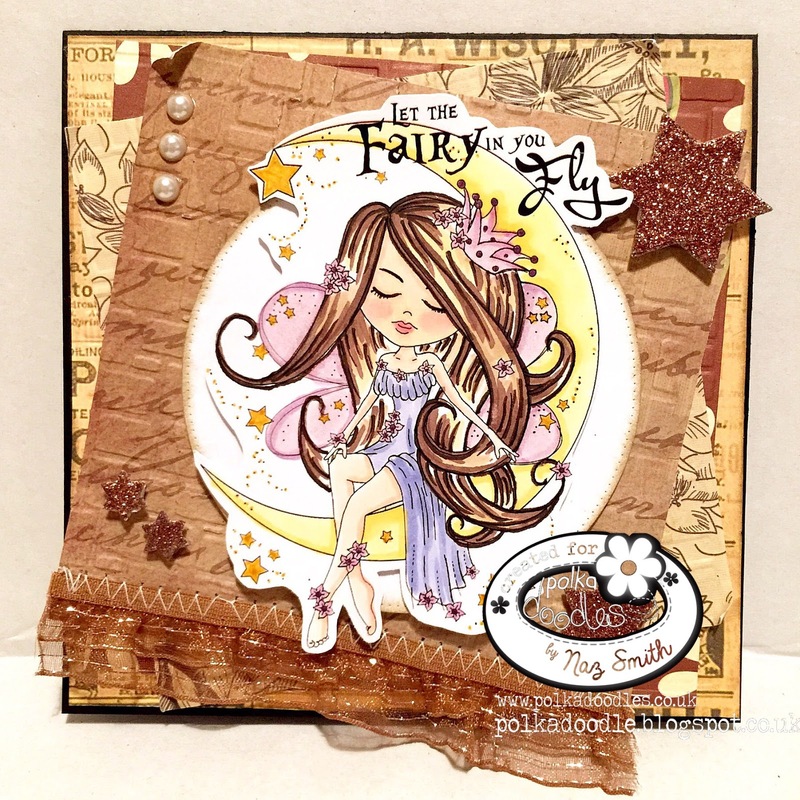 I used the lovely "Serenity Blossom" from Serenity Collection, all the papers are from the same collection. Also you can find "Serenity Blossom" individually here. 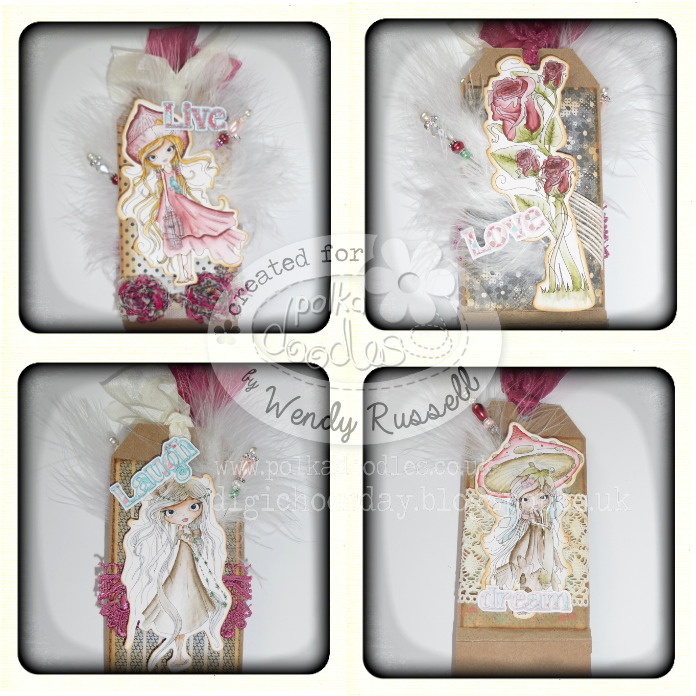 Wendy - For this weeks card I've used an early Work & Play collection again. The image is the Ballerina from Work & Play 2. You can also get her as a digi here or as a clear stamp here. Both papers are also from this collection. 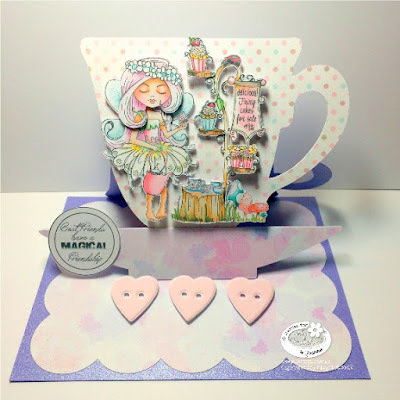 Yvonne - I used the precoloured Fairycakes from the new Serenity Collection, I am a bit addicted to this collection. You can see the collection here as a Digi Download or as a CD-Rom. I managed to misplace my buttons but I was able to use some of the papercraft buttons on the Octavia Moonfly Collection. You can see the collection here or the CD-Rom. I cut out 3 copies of Fairycakes and then attempted to decoupage her. I am not sure if it worked but I liked it lots. Anjie - I have used the Oddella Twig image from the Ickyink Collection, and have coloured her with my Graph'It Markers. The papers are from the Pretty Tuff CD which work perfectly with these images! 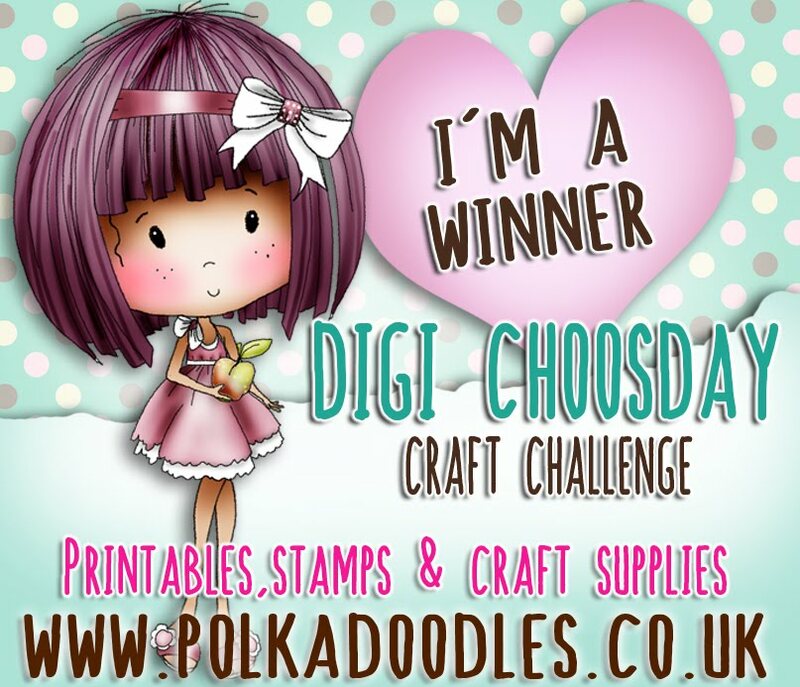 Please email us at sales@polkadoodles.co.uk quoting DCW021001 to claim your prize of a £5 of free downloads from the digi store! As it's a Digi Choosday that means one thing... DISCOUNT DAY! WHOOP WHOOOP! (not individual digis).....Don't miss out, this offer expires on 14th June! We give you two weeks to enter so that means the CLOSING DATE IS 23rd June 2015 and the winners will be announced on 30thJune 2015. The winner and top 3 for week 20 Add a Bow can be found at the bottom of this post. Yvonne - Hello there! 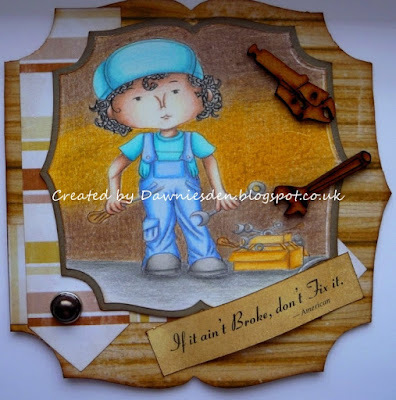 I loved loved loved colouring 'Skater Boy' from Work & Play 11 with my polychromos pencils for a sample for a recent Create & Craft show Nikky was on a few weeks ago, so thought I would share him with you today. The papers, sentiment and embellishment are all from the same collection which you can get as a digi download collection or as a CD-Rom. Alternatively you can get the single digi here. Tanya ...For this week’s challenge I’ve used a total of three collections Work & Play 7 for the coloured digi, Work & Play 11 for the papers and Work & Play 9 Love Collection for the scrabble tiles. 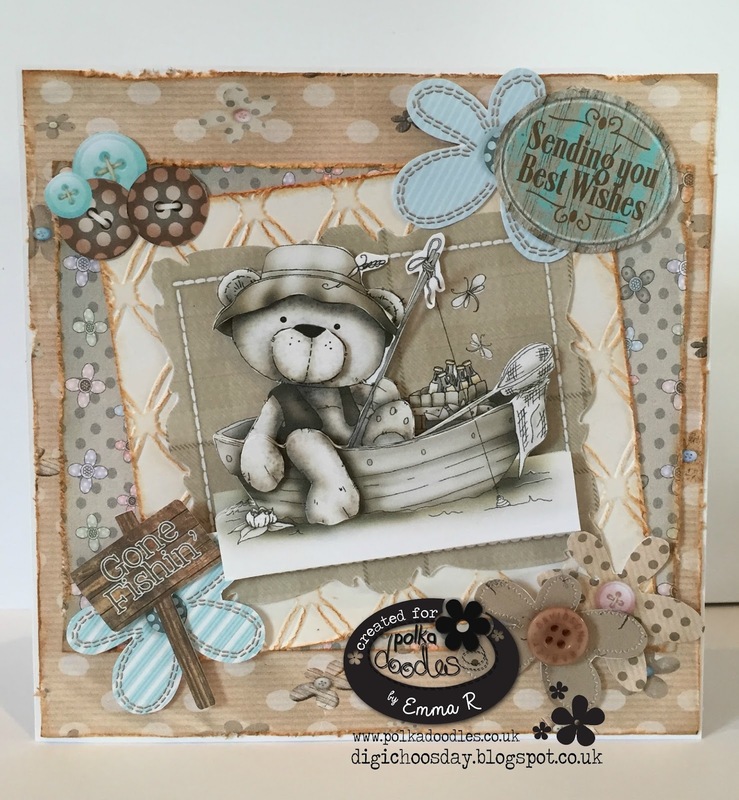 My simple card shows how versatile the coloured digis and papers are and that you don’t have to be an expert colourist (is that even a word….ha ha ha) to make an effective and beautiful card. I’ve made it for my dad, so, shhhh….don’t tell him. Dawn I have used Plumber. 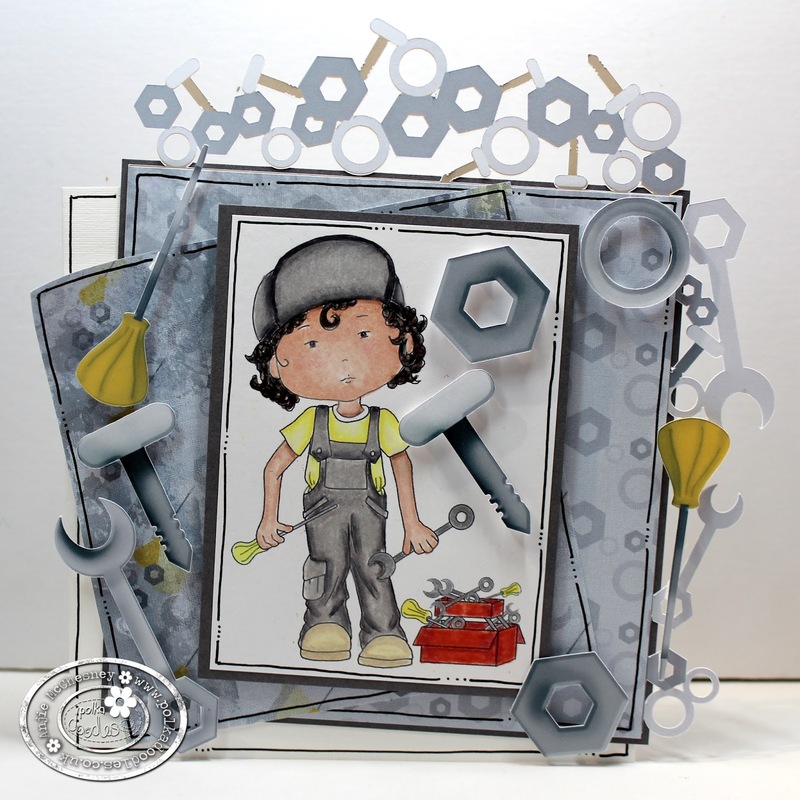 Mechanic digi stamp from the Work & Play 11 collection, This can also be bought as a separate digi stamp here. I have coloured it with Polychromo pencils & the paperrs used are also from the same collection. These are perfect for those always hard to do male cards. Monica - My project for this Father Day is a "Pocket protector slide card" for the Geek Dad (everybody has at least one in the family). 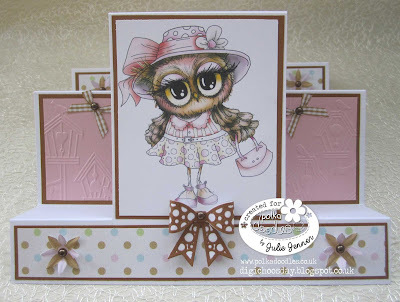 I used Horace, that is also included on Cherryblossom Lane collection. The papers I used are from the same collection. Julie - I decided to make a shaped card this week using Polkadoodles Winston Digi Download, this image is called Gone Fishing and is available, in outline only, singly in the Digi Download store HERE On the CD and in the download there is also a coloured version which is what I have used here. The spotty kraft paper, buttons, Gone Fishing sign and sentiment are also from the Winston digi download/CD, I used Gathered Twigs distress ink around the edges of the paper. 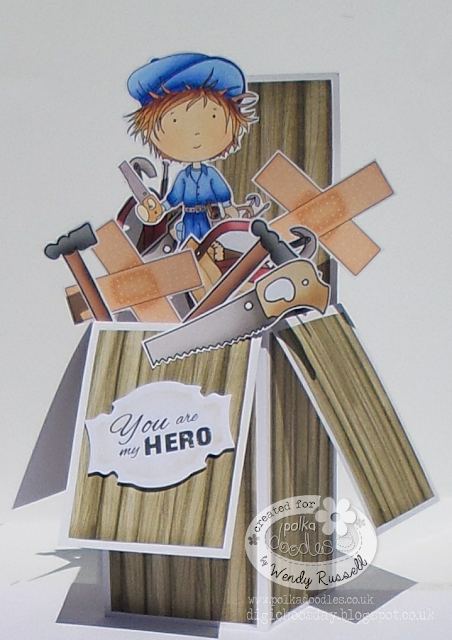 Wendy - For my box card, I've gone back a few collections to Work & Play 1 and used Handyman Dave, who is also available as an individual digi here. 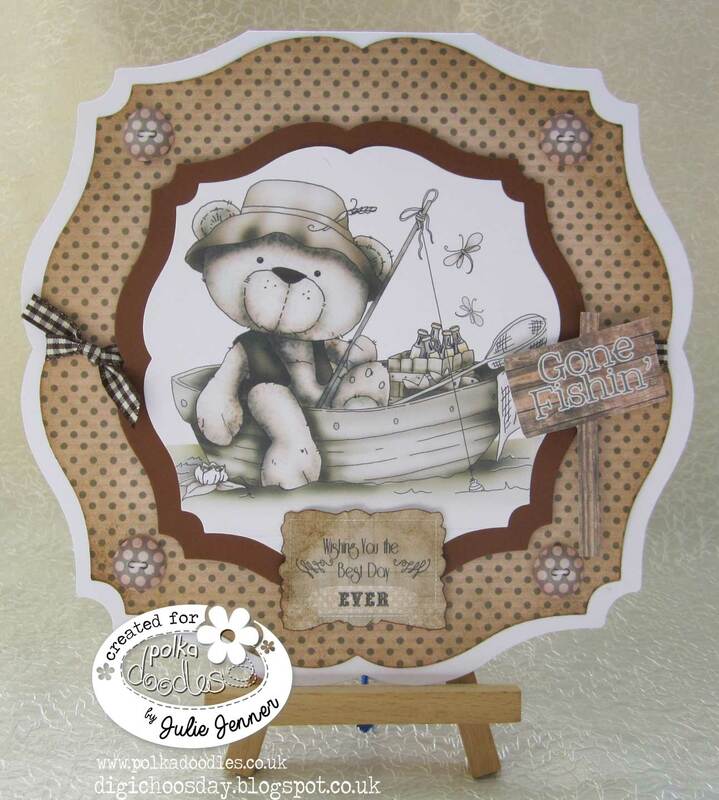 All the embellies & the sentiment are also from the same collection, as is the wood effect paper. Emma - For my Father/Male card I have kept it pretty simple as i know the male of the spiecies doesn't like all the fiddly bits & bobs that us women like. I have coloured up the sweet little Karate Boy stamp that can be found Here, i have used one of the papers that go with the Work & Play 7 set that you can find in download form Here or in CD form Here. Anjie - I have used the Handyman image from the Work and Play 11 download collection. The image is available on it's own HERE. I have used Prisma pencils to colour him. All the papers, embellies and borders are all from the same collection. Now for the winner and top three from week 20! 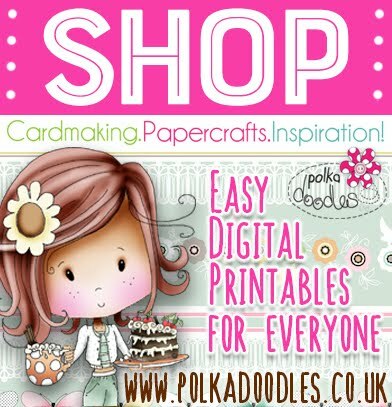 Please email us at sales@polkadoodles.co.uk quoting DCW020001 to claim your prize of a £5 of free downloads from the digi store!